I love mat training – and specifically Dr. Karen Overall’s Relaxation Protocol. It’s one of the first things I recommend in many online training cases. “Why?” you may ask. How does teaching a dog to lie on a towel help with anything at all? Isn’t exercising your dog a faster way to get good behavior? I think of mat training as the ultimate way to teach a dog to calm down. On its face, mat training is pretty simple. You just teach your dog to lie down on a towel/mat/blanket. Pretty simple. This tool is incredible. Using a specific protocol, you’ll be able to teach your dog to stay lying down on the mat through increasingly difficult and distracting environments. Excited greeters. They’ll learn to stay on their mat when someone knocks on the door. (buy our e-book on that topic here). Dogs with low frustration tolerance and impulse control. They learn to calm down and turn off. High-energy dogs. They learn how to lie down and watch the world go by – in exchange for tasty treats. Pushy dogs. If your dog is on his mat, he’s not drooling on Auntie Muriel’s leg at Thanksgiving. Reactive dogs. At a high level of reactive dog training, mat training can help dogs relax around other dogs. Competitive dogs. Use a mat to teach your competition dog to chill out at events. The vet. On a whim, I told Barley to “go to your mat” at the vet’s. He ran right over to their scale and flopped down on it. The vet’s jaw was on the floor. Public transit. I put Barley’s mat on the floor of the bus or light rail, and he flops right down. Bar and Brewery Visits. Mat training helps dogs learn how to lie down and ignore the hubbub of public outings. What Exactly is a Relaxation Protocol? Karen Overall’s Relaxation Protocol is a structured introduction to mat training. Mat training is a simple concept. You teach your dog to lie down on a specific mat/towel/blanket. It’s really important that the “mat” used for training isn’t normally on the ground. We want the dog to learn that if the mat is on the ground, I lie on the mat. No matter what. The rule of the game for your dog is simple: Fido stays lying down on the mat. No matter what. If Fido gets up, the mat goes away for a 10-second timeout. As long as Fido stays on the mat, Fido gets paid in chicken. Sounds easy enough, right? Watch this video to see some mat training in action. You’ll be here in 15 days! 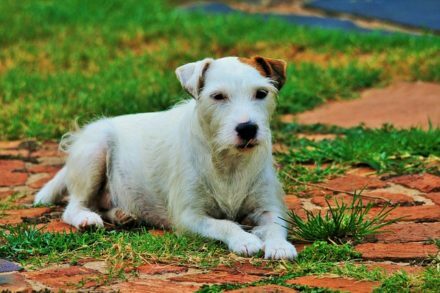 Teaching your dog to lie down and chill out is an imperative skill for almost every dog – but it will take practice. Never forget about the importance of practicing in dog training! Mat training is a simple concept, but it takes patience and consistency to get right. Think of this protocol as a structured 15-day training plan to get started on mat training. Her program is well-used by dog trainers of all types – for good reason. This step-by-step program starts out easy and gets progressively harder. Follow it step by step, and your dog will be a mat training addict in no time. These 18 pages are your new best friend. We will use treats for this training, so be sure to have them handy. Don’t forget to avoid these 8 common mistakes in food training. Start out by shaking the towel out. Look at it, talk about it, make your dog intrigued. Put the mat on the ground and tell your dog to lie down on it (easier and faster). Shape your dog onto the mat (see below). This is more challenging for you and your dog, but I also think it’s more fun (and effective). Put the mat on the ground after making a fuss about it. Use tasty treats to make your dog really focus on you – and love the mat. Click and treat for looking at the mat. Toss treats onto the mat. Click and treat for any movement towards the mat. Reward him for putting his paws on the mat. Click and treat for staying on the mat. Reinforce him for sitting on the mat. Click and JACKPOT for lying on the mat. Continue to reward your dog for staying on the mat for ~10 seconds. Toss a treat away from the mat. Repeat steps above. Save your best treats for when he lies down on the mat! Gradually start only clicking and treating when your dog goes over to the mat and lies down on it. Don’t make it too hard to fast, though! You can see why telling your dog to lie down on the mat is faster. I personally find that dogs that are shaped onto the mat learn the association between the mat and the reward more quickly. Do what works for you. Check out our different remote and online training options. We offer subscription-based instant email/text Q&As as well as hourly video chat training. Trainer’s Tip: I downloaded the protocol to my phone and do mat training with my dog whenever I can. For days 1-15, I fed Barley his dinner via mat training. There were days where we didn’t finish, and days we had to repeat. That’s ok. Barley demonstrates his mat training at the vet while waiting to get staples put in his foot. Once Barley and I finished day 15, we took the mat training game on the road. We went into the back yard. Then the front yard. Then the park. We made it harder by having other people around. I made it really hard by picking up a stick and rewarding him for ignoring it. I use mat training to teach Barley how to lie calmly under a table at outdoor bars. He lies on his mat on the light rail. We bring the mat to the vet, and he happily flops down onto it to wait for his checkups. In short, the mat is Barley’s happy place. He knows that if he stays on the mat, good things happen – even if people are knocking on the door. And it all started with Day 1 of the relaxation protocol. 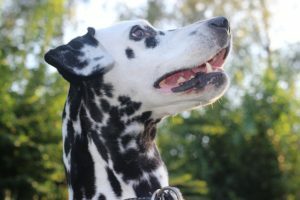 Pingback: How to Calm a Hyper Dog: Games & Tips For Calming High Energy Dogs! Pingback: Treibball 101: Equipment, Training, & Rules For Newbies! Pingback: What Do Different Dog Barks Mean? An Analysis Of 11 Different Barks! Pingback: How To Introde Your Dog To Your Newborn Baby: Slow & Steady! Pingback: How to Make A Dog Sleep: Getting Your Pup to Snooze! Pingback: Ask a Trainer: How should I manage dog-dog resource guarding? 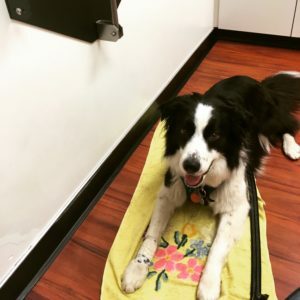 Pingback: Aggression in Dogs: How Dangerous is My Dog, and How Can I Stop It? This might be a silly question but I’ve noticed this in my own border collie and I am wondering about it. In the first video on the page when you are demonstrating the mat, I notice that the dog licks his lip/nose after a treat is given. I’ve been told licking the lips or nose is a sign of stress and I should do something to reduce stress. It’s weird though after a treat. What do you think? Is lip licking I’m this case a sign of stress? I don’t think that’s a silly question at all! Great observational skills. Lip licking right after a treat seems, to me, to be normal behavior. I always was taught that (and now therefore teach others that) signs of stress are normal behaviors that are showing up in an abnormal way. So licking your lips before (or after) eating probably isn’t a weird time to lick your lips. I also learned in our scentwork classes that licking over the nose helps strengthen the nose’s capability to capture scent. Therefore, that might be a way for your dog to gather more info if his tongue is flicking over his nose. Finally, it could be that he’s stressed, but not all stress is inherently bad. Do I get stressed out during a tempo run? Yes! Do I get stressed when I’m learning a new skill? Absolutely. Your dog might be a bit stressed because he’s focusing and being challenged, and that doesn’t have to be a bad thing. Lots of dog owners talk about their dog’s crate as his “happy place”. Should the mat be treated as a separate place, or can it be put inside the kennel? Great question, Kara! I’ve had clients put the mat inside the crate for training (or even modify the protocol for crate training use). Personally, I think the beauty of mat training is that I can take the mat anywhere, so I don’t pair it with the crate. If your dog already has bad feelings about the crate, you might also poison the mat by pairing the two. So… it depends! I started mat training with my boy yesterday. Should I leave the mat on the ground and reward him when he lies on it randomly throughout the day? Or should I get excited about it and reintroduce it every time we’re going to train? Also we’ve only been able to get to step two of the protocol: lying down for 10 seconds. As soon as I take a step back, he gets up. I’ve been starting over or ending the training session there. Is that the best thing to do? Thanks for the great content! Cheers! My problem is my puppy loves to go on the mat, but quickly starts chewing and trying to rip up the mat. Gotcha. Are you giving treats quickly enough? Chewing and shredding is usually a sign of boredom or need for exercise – you might need to exercise your puppy more or give treats more quickly to keep her interested. Wonderful wonderful resource and techniques!! I was wondering if it would be acceptable to teach a cue such as go to your mat/place in the beginning just in the event that the mat/place needs to be a different item because you forgot to bring the specific mat somewhere or you want to change the item out entirely. Also do you use the same release cue that you use for a stay (I avoid the use of OK for a release word except for if i ask for a simple wait)instead Iuse break. Thank you in advance. That’s a great question, Cathie! I thought it without a cue initially and usually instruct people to do the same, but I don’t see why it would be a problem. I know my dog is now magnetized to small pieces of fabric and I can’t leave them out while we’re training! He generalized the concept almost too well. I also taught a release cue early because Barley didn’t get up otherwise. I just used our hand targets to get him up and off.